The Samsung users can now enjoy the Chat ON messenger service provided by Samsung. It seems to be taking its instant messenger service, Chat ON, with a companion app ChatONV that will enable users to make voice calls to other ChatON users. This ChatONV app is supposed to let Samsung’s range of all devices including phones, tablets and even cameras to make voice calls. This app was found on Samsung’s Galaxy Camera and though it is a separate app on the device, the voice calling feature could be integrated in the same ChatON app in the near future. 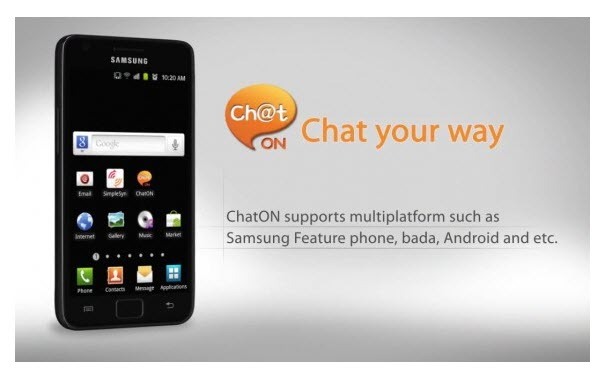 We have also heard rumors of Samsung adding support for video calls to its ChatON service, called “Video ChatON” by the end of this year. This service will allow the users to make video calls over 3G/4G or WiFi networks to other ChatON users. The ChatON app is soon going to be the all in one app for communicating with your family and friends and it will comes with pre-installed on all Samsung devices. However, we doubt if they would actually launch the “ChatONV” app and “Video ChatON” services as separate apps. It is only in the development phase of these new services that we are seeing them separately, the all in one package should only come as an update to the original app.